I can understand that JP is puzzled. Normally we would certainly expect monetary easing to mean that the currency should weaken. However, I think there is a pretty straightforward explanation to this and it has to do with the monetary linkages between the US and the euro zone. 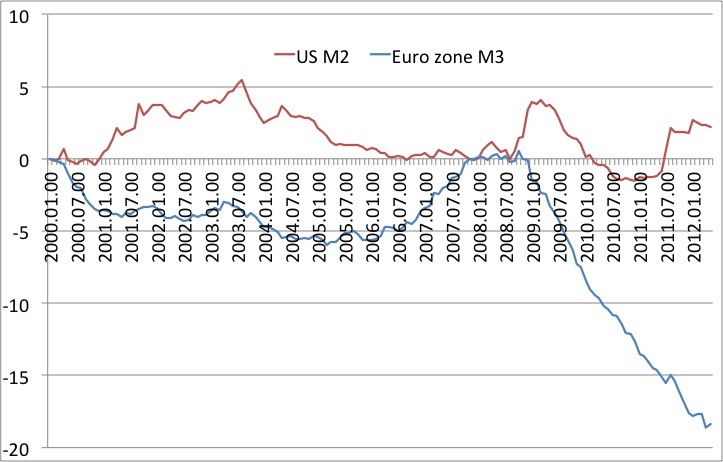 In my post Between the money supply and velocity – the euro zone vs the US from earlier in the week I described how I think the origin of the tightening of US monetary conditions in 2008 was a sharp rise in European dollar demand. When European investors in 2008 scrambled to increase their cash holdings they did not primarily demand euros, but US dollars. 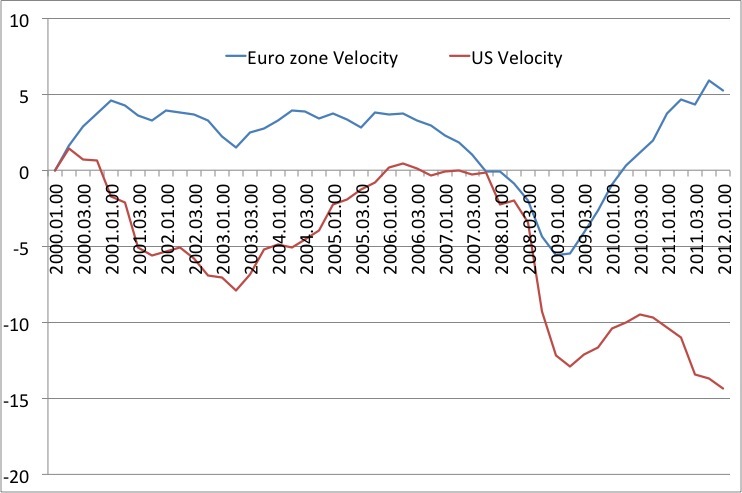 As a result US money-velocity dropped much more than European money-velocity, but at the same time the ECB failed to curb the drop in money supply growth. The sharp increase in dollar demand caused EUR/USD to plummet (the dollar strengthened). What happened yesterday was exactly the opposite. Draghi effectively announced that he would increase the euro zone money supply and hence reduce the risk of crisis. With an escalation of the euro crisis less likely investors did move to reduce their demand for cash and since the dollar is the reserve currency of the world (and Europe) dollar demand dropped and as a result EUR/USD spiked. Hence, yesterday’s market action is fully in line with the mechanisms that came into play in 2008 and have been in play ever since. In that regard, it should be noted that Mario Draghi not only eased monetary policy in Europe yesterday, but also in the US as his comments led to a drop in dollar demand. Finally this is a very good illustration of Scott Sumner’s point that monetary policy tends to work with long and variable leads. The expectational channel is extremely important in the monetary transmission mechanism, but so are – as I have often stressed – the international monetary linkages. In that regard it is paradoxical that University of Chicago (!!) economics professor Casey Mulligan exactly yesterday decided to publish a comment claiming that monetary policy does not have an impact on markets. Casey, did you see the reaction to Draghi’s comments? Or maybe it was just a technology shock?